Pastor: Rev. Steephen Koola, C.M.I. Sundays — Sat evening: 4 p.m.; Sun: 10 a.m.
To alleviate overcrowding at Holy Name, Saint Thomas More, and Most Blessed Sacrament Parishes, Archbishop John A. Floersh established Sts. Simon and Jude in South Louisville in 1950 and appointed Father Louis Bossung as pastor. Mass was celebrated at the American Legion Hall until a church was constructed on “bottoms” land, known as the home of baseball diamonds. The L-shaped building, with a combination church and cafeteria above a full basement, was completed in August 1952. Staffed by the Dominican Sisters, the school opened in September of that year. Father Bossung became seriously ill in 1955, and Father William C. Hartlage became pastor and led the parish through its formative years. The parish experienced a great deal of growth during this time and with nearly 800 students by 1965, the school was one of the largest in the city limits. In response to this growth, the parish completed the construction of six additional classrooms. Father Hartlage and the parishioners performed most of the construction work. Although early parish life focused on building and fundraising, parishioners carried out numerous ministries through groups such as the women’s and men’s clubs, the St. Vincent de Paul Society, and a Don Bosco Club for boys ages nine to fifteen, which attracted more than 100 active members. During the 1970s and 1980s, stained-glass windows were installed, the “white building” was completed, and a food pantry and clothing store were established. The school’s breakfast program and the first parish-school dyslexia program began in 1971. The parish initiated a home visitation program to spend time with individual families and understand parish needs better. 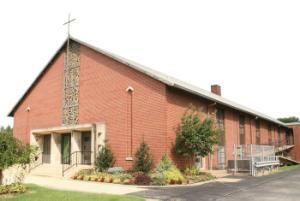 During the late 1980s and 1990s, the interior of the church was repainted, new altar furniture was designed and installed, the school was consolidated into one building with an expanded library, and a new computer lab and kindergarten was added to the school. The “white building” was established as the new parish center. The parish insulated the gym, air conditioned and put a new roof on the school and church, and replaced the sound system. In 2005, Saints Simon and Jude joined with Our Lady of Mount Carmel, Saint Thomas More, and Most Blessed Sacrament to form Saint Nicholas Academy, a regional school. Today, with more than 580 parishioners, Saints Simon & Jude works with its clustered partner, Most Blessed Sacrament Church, to offer religious education for children attending public schools and RCIA for adults interested in the Catholic faith. With its thrift store and senior citizens’ group called the “Simon Sociables,” the parish continues its love and care of the vulnerable, especially children and the elderly.